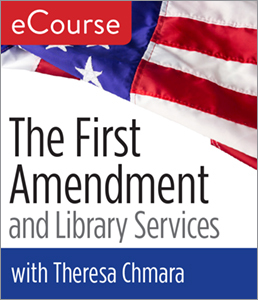 Chicago—ALA Publishing eLearning Solutions announces a new facilitated eCourse in collaboration with the Office for Intellectual Freedom, The First Amendment and Library Services. Theresa Chmara will serve as the instructor for a 4-week facilitated eCourse starting on Monday, March 4, 2019. Librarians and library staff are aware that the free and equitable provision of information is an important part of the library's mission. The First Amendment protects the right to speak, publish, read, and view materials in the library, but courts have recognized that libraries also must have reasonable rules in place for patron use of the library, consistent with the library's mission to provide access to library materials and services to the entire library community. While this course will be covering basic legal concepts, the content of this course is not legal advice and should not be used in place of legal representation. Registration for this ALA Publishing eLearning Solutions facilitated eCourse, which begins on March 4, 2019, can be purchased at the ALA Store. Participants in this course will need regular access to a computer with an internet connection for online message board participation, viewing online video, listening to streaming audio (MP3 files), and downloading and viewing PDF and PowerPoint files.